The 2017-18 National Hockey League season opens tonight in Pittsburgh for the St. Louis Blues. 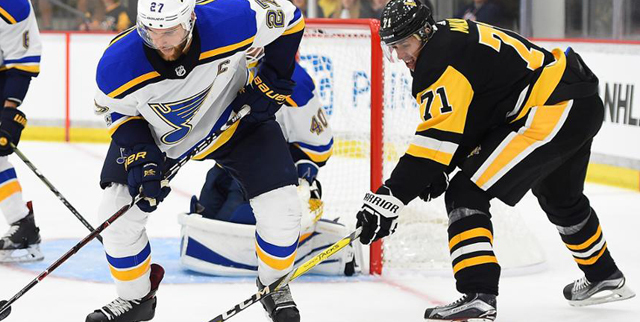 They will take on the Pittsburgh Penguins tonight before returning to Scottrade Center in St. Louis on Saturday for the home opener against the Dallas Stars. The puck is scheduled to drop at 7 pm tonight with the game being shown nationally on NBCSN. While the team will hit the ice on the road tonight, the Blues will be hosting a season-opening event tonight at Ballpark Village in downtown St. Louis tonight. Happy hour will start Fox Sports Midwest Live! at 4 pm and will feature appearances by Blues celebrities, prizes like free gas for a year from Phillips 66, Blues tickets, memorabilia and more. The ‘Note will of course look to 25-year old Russian Vladimir Tarasenko to lead the team offensively this season. One of the premier snipers in the NHL, Tarasenko scored 39 goals and added 36 assists last season in playing all 82 regular season games. The 3-time All-Star will begin his sixth NHL season tonight. He’s gone from struggling to order 10 slices of ham at the grocery store to the comfort of living in the St. Louis suburbs in a beautiful home with his wife and two sons. When the Blues released their 23-man opening night roster earlier this week there were also a couple of surprises sprinkled among the familiar faces. Among a group that includes Jake Allen in goal, Colton Parayko and Alex Pietrangelo on defense as well as Jaden Schwartz and Paul Stastny as forwards, you have a few new faces. Tage Thompson and Vince Dunn will both be seeing NHL action for the first time in their careers tonight. Thompson, a 6’5″ center, was selected by the Blues in the first round (26th overall) of the 2016 NHL Entry Draft. 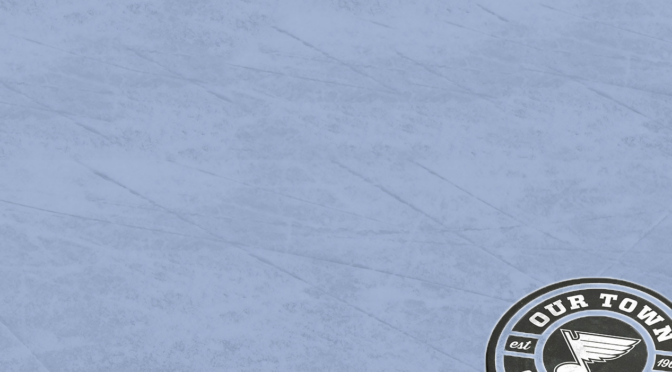 He spent the last two seasons playing for the University of Connecticut and won a Gold Medal for the United States at the 2017 IIHF World Junior Championship earlier this year. Thompson’s lone goal of the tournament, to go along with his four assists, made the rounds in the hockey world. Dunn had his first taste of professional hockey last season with the Chicago Wolves of the AHL. The 20-year old defenseman recorded 13 goals and 32 assists in 72 games. He had his own highlight clip of sorts go viral last year when he had an altercation with Kurtis Gabriel of the Iowa Wild that continued off the ice. Wade Megan will be beginning the season in the NHL for the first time in his career. The center made his NHL debut last season with the Blues and played in three games, recording his lone goal on his first career shot. Megan led the American Hockey League in scoring last season with 33 goals. Brayden Schenn is another new face to the Blues lineup. Schenn was acquired in a trade with the Philadelphia Flyers in June for Jori Lehtera. The 26-year old forward tied for the league lead in power play goals last season with Alex Ovechkin and Nikita Kucherov. Mike Yeo will begin a season as the head coach of the St. Louis Blues for the first time in his career. Yeo took over for Ken Hitchcock midway through last season and guided the Blues to a 22-8-2 mark in their last 32 regular season games. Yeo previously coached the NHL’s Minnesota Wild from 2011-16 and complied a 173-132-44 record in 349 career games coaching the team. He was hired by the Blues in June of 2016 as the eventual successor to Hitchcock. There’s never a great time for a team to be bitten by the injury bug, but before the season starts is definitely kind of unique. Alexander Steen, Jay Bouwmeester, Robby Fabbri, Zach Sanford, Patrick Berglund, Klim Kostin and Luke Opilka are all currently injured for the Blues. Berglund, Opilka and Kostin all hold injured, non-roster spots while the others are listed on the injured reserve list. Sanford’s dislocated shoulder will likely keep him out of the lineup for 5-6 months, whereas Bouwmeester and Steen could return by the end of the month. Fabbri, a 21-year old forward, was poised to have a breakout season this year for St. Louis. He missed 31 regular season games this season with an ACL tear. The announcement last week that he will miss the entire 2017-18 season after re-injuring the surgically repaired knee was a crushing blow for the team. Last season, the Pittsburgh Penguins became the first team since the Detroit Red Wings in the late 90’s to repeat as Stanley Cup Champions. A banner commemorating last year’s victory will be raised tonight in Pittsburgh before the game. The Blues will “respectfully skip the pregame ceremonies”, according Jim Thomas of the St. Louis Post-Dispatch. Once the Blues do take the ice they will see a familiar face in an unfamiliar jersey. Ryan Reaves was traded to Pittsburgh back in June in a deal that involved the draft pick that would become Tage Thompson. Reaves played 419 regular season games over seven seasons in a St. Louis sweater, becoming a fan favorite in the process. The enforcer told the Pittsburgh Post-Gazette that he shared some words of wisdom with his former teammates in advance of tonight’s game. “Told every one of them to keep their head up,” Reaves said with a grin Wednesday morning. Kevin Weekes of the NHL Network has a breakdown of tonight’s Blues-Penguins game. Will 2018 be the year the Stanley Cup parades down Market? The quest starts tonight at 7 pm on NBCSN.